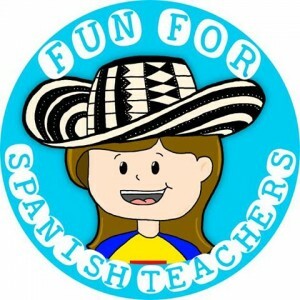 Fun for Spanish Teachers is the name of the blog and store run by a Colombian Spanish teacher located in Boston, Massachusetts. It was created to help early and elementary Spanish teachers add fun to their classes through music that is infused with a diverse array of rhythms from different Latin American cultures. Many of the products and music can be purchased on Teachers Pay Teachers and iTunes! knew some Spanish to share with your students but don’t know a word? knew a song or game in Spanish to play with your students? bring deeper respect for other cultures by introducing a new language? integrate Spanish with your curriculum with minimal effort? include some Spanish in your daily schedule with your class? Then this is right workshop for you! Everyday Spanish for Teachers was designed for teachers who have little or no experience with the Spanish language. During the workshop, participants will play, sing, dance and enjoy puppet shows! At the end of the session, you will have a bag full of ideas ready to use with your students. All participants will receive songs and games to play in class and a a list of sentences that can be used in your daily routine. We hope you will join us for this very interactive learning session!! Carolina Gomez-Kramer grew up in Colombia, South America. She holds a Bachelors degree in Modern Languages from La Universidad del Valle in Colombia and a Masters in Intercultural Relations from Lesley University in Boston. Carolina enjoys teaching children her language and exploring the vibrant cultures of Latin America in a fun way and has been teaching languages to children for over 12 years in Colombia, Guatemala, and the United States – in private schools, public schools, and out-of-school settings. In 2005, Carolina founded 1-2-3 Spanish Together, an early language music and curriculum designed to teach Spanish to children and their families and help other teachers learn the trade. We are very excited for TECPA to join forces with 123 Spanish! Fun for Spanish Teachers™ is a small company based in Boston, Massachusetts. We created it to help early and elementary Spanish teachers add fun to their classes through music that is infused with a diverse array of rhythms from different Latin American cultures. Our music CD’s are already used in a variety of early learning centers across the United States as well as in countries around the world. Carolina is the founder of 1-2-3 Spanish Together™, an early language program designed to teach young children Spanish. She is also a classroom K-3 Spanish teacher. As a teacher, she had difficulty finding music to teach Spanish as a foreign language to children, and, as a result, she has created many of the songs in the curriculum. If you are looking for fun materials and resources for your classes, Fun for Spanish Teachers is the place to go! We Are Now Registering For Our Fall Clases! Workshops for Spanish teachers, preschools teachers, family centers and libraries. Classes for children up to 6 years old in Jamaica Plain. Enrichment program for preschool and libraries. Classes for children up to 6 years old in Hingham. Spanish & Movement classes for children up to 4.5 years old in Natick. Classes for children up to 6 years old. Enrichment program for preschools, day care facilities and after school programs. We are very excited to announce that through our licensee program, Spanish & Movement classes for children are being offer in more locations! Find a class close to you and join with us to learn Spanish in a fun and educational way! Workshops for Spanish teachers, preschools teachers, family centers and libraries. We also offer our Cha-cha-chá Fiestas to help you celebrate your child’s birthday with a lot of rolled “R’s” and upbeat music. Classes for children up to 6 years old in Cambridge. Giveaway: Mi Clase de Música: Multiple Intelligences in one music CD! In a recent summer trip to Colombia, I had the opportunity to meet Freddy Morales, an early childhood educator who teaches music and movement classes to young children. I had the opportunity to experience a class myself as a parent with my daughter who at that time was three years old. As a teacher of young children myself, I was impressed with how talented Freddy was in his ability to make connections with the children. Since I had a wonderful experience in his classes, I later discovered that he was teaching music and movement classes for babies at a learning center called Tralalá and happily enrolled my second child in a class just for babies! This time I learned that Freddy had his own music CD’s, and the main focus was to teach “music and movement” through multiple intelligences. My baby not only had a fun and educational time in his classes, but he also get to benefit from his music CD at home, where he dances to it in his high chair on a daily basis! Freddy’s CD, “Mi Clase de Música“ has 13 tracks, and each track is geared toward exploring one or more intelligences. This music CD also has a lot of repetition, something that is very important for young children. It includes some Colombian rhythms and is full of a lot of fun. I have used some of the songs with my own students and they enjoy this production a lot. This music CD has been recorded in Colombia and is only in Spanish, a plus if you are looking for authentic materials to bring to your classes or use at home with your children. We would like one of our Facebook “likers” to be the first one to get a copy. We will be giving away the “Mi Clase de Música“ CD so you can sing our songs in your classroom with your students or at home with your child. 1. First, make sure you like “us” and “Mi Clase de Música“ on Facebook. 2. Once you know you are liking us on Facebook. 3. Like our link about the giveway on both pages “ours” and “Mi Clase de Música“. 4. Feel free to comment! We would love to hear from you! Only one entry per person. No anonymous entries are permitted. The winner will be chosen randomly. We will announce the winner on February 1, 2012. Entries submitted after 10:00 pm Eastern time are not valid. We will give the winner 48 hours to claim their prize. United States & Canada ONLY! Then this is right workshop for you! Everyday Spanish for Teachers was designed for teachers who have little or no experience with the Spanish language. During the workshop, participants will play, sing, dance and enjoy puppet shows! At the end of the session, you will have a bag full of ideas ready to use with your students. All participants will receive a CD with songs and games to play in class and a CD with sentences that can be used in your daily routine. We hope you will join us for this very interactive learning session!! Find Our Music on iTunes, Amazon & CD Baby! Registration for Winter Classes is Now Open! We are already registering for our Spanish & Movement classes for babies and toddlers in Jamaica Plain. We will be offering two sessions on Saturdays! Time: Time:9:40 – 10:20 + Free Play Time! Time: 10:40 – 11:20 + Free Play Time! Upcoming Workshop for Preschool Teachers! We have partnered with TECPA (The Early Childhood Professional Development Association) and will be offering our workshop “Everyday Spanish for Teachers”. Everyday Spanish for Teachers was designed for teachers who have little or no experience with the Spanish language. During the workshop, participants will play, sing, dance and enjoy puppet shows! At the end of the session, you will have a bag full of ideas ready to use with your students. All participants will receive a CD with songs and games to play in class and a CD with sentences that can be used in your daily routine. We hope you will join us for this very interactive learning session! REGISTER HERE!